Coca tea, also called mate de coca, is an herbal tea (infusion) made using the raw or dried leaves of the coca plant, which is native to South America. It is made either by submerging the coca leaf or dipping a tea bag in hot water. The tea is most commonly consumed in the Andes mountain range, particularly Argentina, Bolivia, Colombia and especially in Peru, where it is consumed all around the country. It is greenish yellow in color and has a mild bitter flavor similar to green tea with a more organic sweetness. Though also known as mate, mate de coca has very little in common with the yerba mate drink in Southeastern South America. The leaves of the coca plant contain alkaloids which—when extracted chemically—are the source for cocaine base. However, the amount of coca alkaloid in the raw leaves is small. 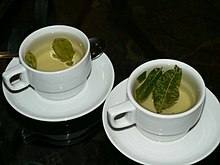 A cup of coca tea prepared from one gram of coca leaves (the typical contents of a tea bag) contains approximately 4.2 mg of organic coca alkaloid. (In comparison, a line of cocaine contains between 20 and 30 milligrams.) 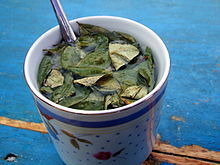 Owing to the presence of these alkaloids, coca tea is a mild stimulant; its consumption may be compared to consumption of a moderately strong cup of coffee or tea. The coca alkaloid content of coca tea is such that the consumption of one cup of coca tea can cause a positive result on a drug test for cocaine, however. Similar to decaffeination in coffee, coca tea can be decocainized. Just as decaffeinated coffee retains a small quantity of caffeine, decocainized coca tea will still contain a small quantity of organic coca alkaloids. Coca tea is legal in Colombia, Peru, Bolivia, Argentina, Ecuador, and Chile. However, its use is being discouraged in part by the Single Convention on Narcotic Drugs. Coca tea is illegal in the United States unless it is decocainized. Many Andean indigenous peoples use the tea for medicinal purposes. Coca tea is often recommended for travelers in the Andes to prevent altitude sickness. However, its actual effectiveness has never been systematically studied. Coca tea has been used to wean cocaine addicts off the drug. Wikimedia Commons has media related to Mate de coca. ^ Jerome J. Platt (2000). Cocaine Addiction: Theory, Research and Treatment. Harvard University Press. p. 28. ISBN 978-0-674-00178-7. ^ Jim Shultz; Melissa Draper (2008). Dignity and Defiance: Stories from Bolivia's Challenge to Globalization. University of California Press. p. 183. ISBN 978-0-520-25699-6. ^ a b c Amitava Dasgupta (2010). Beating Drug Tests and Defending Positive Results: A Toxicologist's Perspective. Springer. p. 106. ISBN 978-1-60761-526-2. ^ Matthew Garrahan (June 18, 2010). "When Hugo met Oliver". Financial Times Magazine. ^ Richard K. Ries; Shannon C. Miller; David A. Fiellin (2009). Principles of Addiction Medicine. Lippincott Williams & Wilkins. p. 165. ISBN 978-0-7817-7477-2. ^ Substances that produce addiction Archived October 26, 2006, at the Wayback Machine – University of Buenos Aires (in Spanish). ^ a b Andrew M. Luks, et al. "Wilderness Medical Society Consensus Guidelines for the Prevention and Treatment of Acute Altitude Illness: 2014 Update". Wilderness & Environmental Medicine, 25, S4–S14 (2014). ^ Ronald K. Siegel (2005). Intoxication: The Universal Drive For Mind-Altering Substances. Inner Traditions * Bear & Company. p. 297. ISBN 978-1-59477-069-2.